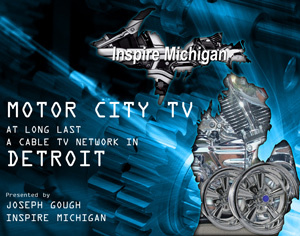 Inspire Michigan was founded in 2007 by a committed group of Michigan natives. After observing years of negative media coverage, we realized that our state’s business and financial leadership had become fragmented. Blind to the devastating effects on their communities, many politicians and executives concentrate on protecting their own piece of the pie. It has become abundantly clear that we need to restore a spirit of regional collaboration in order to survive in a global economy. Inspire Michigan looks at the bleak forecasts and dire circumstances as an amazing opportunity. No group of citizenry has ever taken a state, or even a city, from worst to first. Our comeback story can be the most epic tale of economic development and melting pot collaboration that has ever been written. Now, it is our turn to work together and write that story. It is time to retool Michigan and utilize her formidable infrastructure and highly skilled workforce in creative new ways. By using dynamic events designed to stimulate the economy, we can restore community spirit, create excitement, and promote a positive frame of mind for Michiganders. Perspective is everything in this battle… and it is a battle. We need optimism and opportunism to reign over our communities, and that will require action. By taking action to change the negative perception, we will change the negative reality. A committed group of intelligent individuals, who join forces in true belief of a just cause, cannot be denied their ultimate goal. Inspire Michigan exists to make that dream a reality.